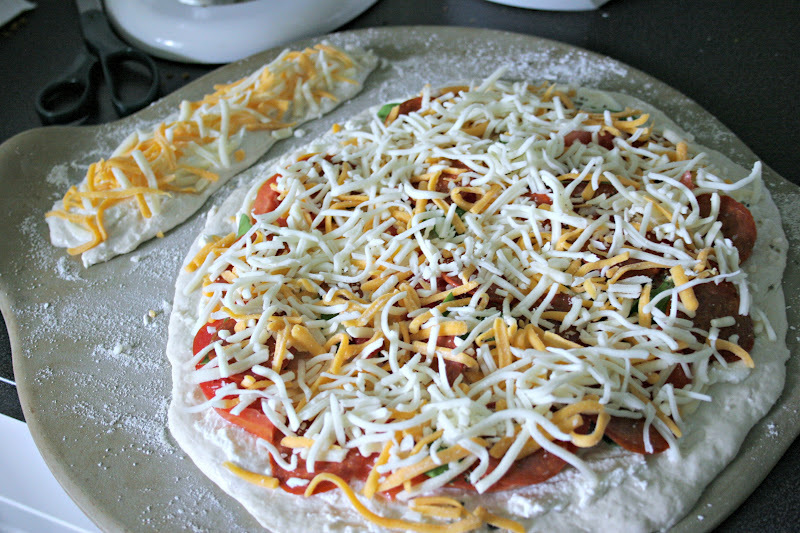 I've been making homemade pizza for awhile and have been using a pizza crust recipe I think I found on Money Saving Mom. It was good. It's whole wheat. It came out thicker and chewier than we prefer, but it mixed in the bread machine, which was nice. Then, I got this idea to use the artisan bread in five minutes a day dough (I make this sometimes, I blogged about it here - so go there if you want to read how I do it, and you can see the recipe and read about the details here, or buy the book) as pizza crust and oh.my.goodness. It's better than good. Thin and crispy like we like! And SUPER EASY. The artisan bread in five minutes a day dough is so easy - water, flour, yeast stirred up and thrown in the fridge - it's kind of ridiculous. If you like bread, you should try it. 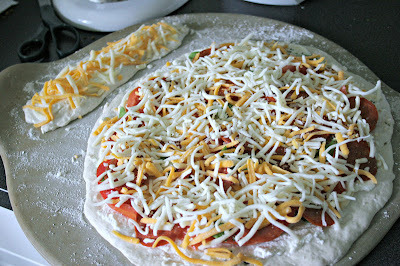 And I have to say now that I am sure I can use the dough for pizza, I'll be making it more. Here's the dough rolled out on the pizza stone. I liberally sprinkled the stone with cornmeal before slapping the dough on there and using my (floured) hands to shape it. The big circle is for Matt and I and the small loafish piece is for Cadence. Because she's picky. Cadence's is topped with ricotta and a shredded cheese blend. The grown-up one has ricotta, sliced tomatoes (from the garden), fresh basil, pepperoni, and a shredded cheese blend. I baked it at 450 for about 20 minutes. Which may have been a bit long, looking at the cheese, but it was still super yummy. Nom. Nom. Nom. The leftover pizza has been in high demand. Yummy,gotta have that bread recipe too!! I love pizza, as you know.